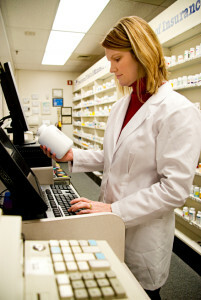 Pharmacies can use Communication In The Pharmacy in a number of innovative ways; for controlling entry, communicating with customers more effectively, in clean room and air lock communications and for department announcements. Communication In The Pharmacy allow you to operative safely and efficiently within your pharmacy, protecting your staff, visitors, and potentially dangerous pharmaceuticals, without having to invest in costly security personnel. Pharmacy departments require security, to control people gaining entry to the department. With Door Entry Stations, access can be controlled easily by a receptionist or by other authorized staff in the department. Where receptions are not manned Customer Help Points give visitors & patients direct communications with department staff. Clean rooms in their nature require a hands free, sterile communications. Special wipe clean, flush fitting Clean Room Stations, provide Duplex communications to the rest of the department. Public Address announcements through out the department are useful when looking for staff, or in a critical situation where urgent information needs to be conveyed.